arms. Some bracket sets had two or three angtou, one above the other. The angtou appeared to slice through the horizontal bracket arms, but actually the length and position of the lower bracket arms were adjusted to give it proper support. 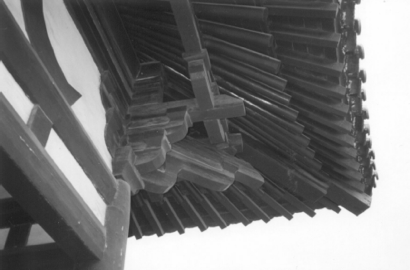 While perched on a stack of bracket arms, the angtou balanced the eaves-purlin outside and the interior aisle purlin inside. The wall-plane acted as a fulcrum. The roof load could be 400 kg./m.2or 80 lb/sq. ft. The eave could cantilever 10 to 12 feet beyond the wall line. and providing better bearing where beam ends joined. buildings, you name it, builders had figured out how to make bracket sets for any situation. and neglect to thrill us with their beauty. can be made of stone in stone structures, but they still remind one of wood. roof. So, the first function of brackets is to support the roof and extend the eaves. invented a larger bracket system that could cantilever farther out from the wall-plane and they added a new structural member—the eave-purlin—to carry rafters beyond the wall purlin. Voilà! Wider eaves. Thus builders were able to preserve the graceful, almost floating effect of the curved roof.